e-petition: End non-stun slaughter etc. The French are simply miles ahead of the UK's piss poor attempts at deradicalisation and combating Islamic jihadism at the grass roots. Our not-fit-for-purpose civil service is quite simply incapable of reacting in the right way, and our civil servants lack the skills, tools and imagination to be in the least way effective. Their failure is gross and culpable. The fish rots from the head - and it is the egregious Mr Jeremy Heywood who must carry the can for the utter incompetence of the UK's response. This is a consultation on draft guidance, to be issued under the Counter-Terrorism and Security Bill, for specified authorities to have due regard to the need to prevent people being drawn into terrorism. Closing date: 30th January 2015. Should we not seriously consider ditching Heywood and his Bullingdon chums and simply ask the Kermits to take over this aspect of government duty? We congratulate Mr Steven Easterbrook on taking over as Chief Executive and President of McDonalds. Mr Easterbrook (Durham) is credited with the company's high street rebranding in the UK from garish plastic red and yellow to a muted dark Brunswick Green. McDonalds remains the only major global fast food retailer to certify all of its products Halal-free in the UK, much to the frustration of Muslims who lobby continuously for halal menu items from the store. The all-Halal KFC therefore remains the outlet of choice for the Friday people whilst those not wanting burgers blessed by imams prefer McD's. "Like all other major UK supermarkets, we source from suppliers who serve Muslim as well as non-Muslim customers. Some of these suppliers process all their meat to Halal standards. For example, all our New Zealand lamb meets Halal standards. In these cases, all of our processes still meet the same stringent animal welfare requirements and all animals are stunned prior to slaughter whether the meat is sold as Halal or non-Halal. With this in mind we also understand that some customers do not want to eat meat that has been blessed. For these customers, we are able to guarantee that our British Organic lamb as well as British Organic, Willow Farm and Finest Free Range chicken has not received a Halal blessing." "We are committed to high standards of animal welfare throughout our supply chain. All of our own brand meat, including all processed products such as ready meals, is from animals stunned before slaughter. The only abattoirs included in our own brand supply chain are single method abattoirs which use stunning before slaughter and do not supply any non-stunned meat. We do sell a selection of branded halal and kosher products in some stores, all of which is very clearly labelled. So only meat branded as such will have been sourced via halal or kosher methods." Between the BBC and the 'quality' print media, I don't recall ever having seen such a poor standard of reporting, so little knowledge, so many errors and so much fiction in the reporting of the 70th anniversary of the liberation of Auschwitz. Hint to Indie picture editors: The red triangle with a P in is a clue; this man was a Polish political prisoner, non-Jewish. Standing at the entrance to the concentration camp, not the extermination camp. There really is no excuse for this piss poor standard of reporting. 1. Please try to ensure you use accurate terms when referring to the extermination camps specifically set up under Operation Reinhard for mass killing of Jews. These were mainly in Poland and include Treblinka, Belzec and Sobibor. 2. Please do not show film of rows of prisoner huts and mass prisoners in striped pyjamas when illustrating pieces about the extermination camps. Extermination camps were designed to move trainloads of Jews straight from the unloading ramps to the gas chambers without a residential stay. The overwhelming majority of jews killed never wore stripey pyjamas. 3. Please try to understand that Auschwitz was two camps - an extermination camp, and a concentration camp. The extermination camp dealt with trainloads of Jews as the other Reinhard camps, the concentration camp accommodated Jews, politicals, homosexuals, criminals, Russians, the disabled etc. 4. Yes, people were individually executed and starved and worked to death in the concentration camps, and they also had cremation ovens, but they were not designed for mass killing but for detention. 5. 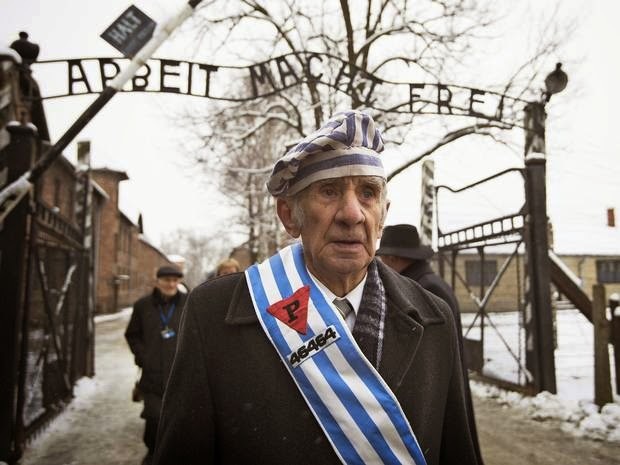 The use of terms such as 'death camps' is lazy reporting and exhibits a poor grasp of Holocaust history. They were by no means homogenous; concentration camps were even visited by the International Red Cross whilst the extermination camps were a State Secret. 6. The extermination camps were nearly all sited in Poland and largely staffed by Ukrainian SS volunteers with German officers and NCOs. The successors of these Ukrainian nazis now hold power in Kiev. 7. If you are looking for modern successors with a similar fascist mindset to the Nazis - a similar disregard for human life, belief in their own racial superiority and embrace of mass judicial murder as a policy instrument, it would be remiss of you and poor journalism to exclude Islamism from mention. Greece - what will it mean? As an example to Europe's voters that they can throw out their stale, incumbent political class as a punishment for past ineffectiveness, it will frighten established traditional parties everywhere. This is a good thing. Greece's deeply corrupt super-rich, whose tax dodging and bribery of government has helped beggar their countrymen, will find themselves hounded out of Greece and have assets within reach confiscated. This is a good thing. Greece will not be able to write-off or default on the nation's massive €320bn debt without detaching from both the Euro and the EU, losing IMF recognition and becoming a temporary international pariah. This is also a good thing. The Greeks know that there is no return to easy wealth and money for nothing, but this won't stop them trying to find ways to make easy money, like a bankrupt playing the lottery. This is a bad thing. EU federasts may contemplate the prospect of the EU federation fragmenting utterly unless they either loosen up on their ambitions (which means abandoning the Euro for all) or invade the Mediterranean nations. Any flexibility is good news for the UK. EU officials, global corporatists and international bankers will all have chattering sphincters this morning at the massive slap from the democratic process. This has to be a good thing. The idiot from Goldman Sachs, the global corporate that helped a corrupt and non-qualifying Greece to lie its way into the Euro, who said at the weekend that the EU federation was essential to maintain American global corporate wealth may like to contemplate his future. Overall, there's no real prospect for any quick improvement in the economy or standard of living for Greeks, but what they've done will benefit us, and the rest of Europe, more than themselves.